You know me, I like chocolate, berries and coffee, I thought hmmmm, why not throw them into one of my favorite weekend breakfast’s, pancakes!! Yup, I did it, I made the most delicious pancakes this past weekend. It’s light fluffy, chocolaty with a slight hint of coffee and one of my favorite berries, raspberries. I spent my Saturday night thinking what kind of pancakes could I make? I asked my Husband what he thought and you know what he said? Haven’t you done it all with pancakes? Um, hello, does he know who his wife is? Of course I haven’t come up with every pancake imaginable! Silly man!! The possibilities are endless! The key is to come up with something tasty, low calorie and something I think everyone will love!! So after staring at my fridge looking for ingredients, I thought raspberries. How could i not of made a pancake with raspberries? That was just crazy!! 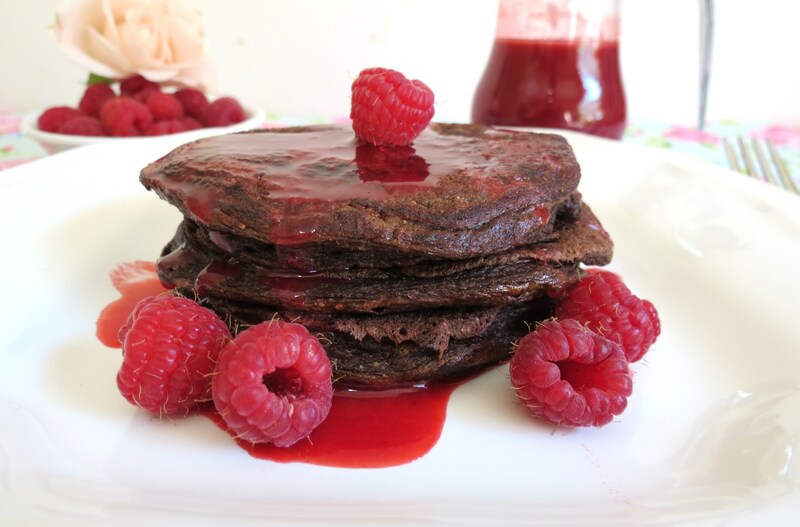 Than Chocolate Espresso raspberry Pancakes were born!!! One berry I love beside blueberries and strawberries is raspberries. They used to be my top favorite fruit. I have bought them earlier I the year but the taste of them do not compare to them as right now. Were just starting raspberry season now. Did you know that raspberries have the most fiber than any other fruit? A half cup of raspberries have 4.6 grams of fiber! Not to shabby and there low-calorie!!! A lot of punch for a little fruit!! So I personally recommend picking up some raspberries! I know a lot of people do mot like raspberries because of the seeds. I get that! Seeds don’t bother me, but I know my Hubbie doesn’t like them because of seeds. I like the seeds, I like the little extra crunch I get from them. However, I have a solution for you if you don’t like the seeds. 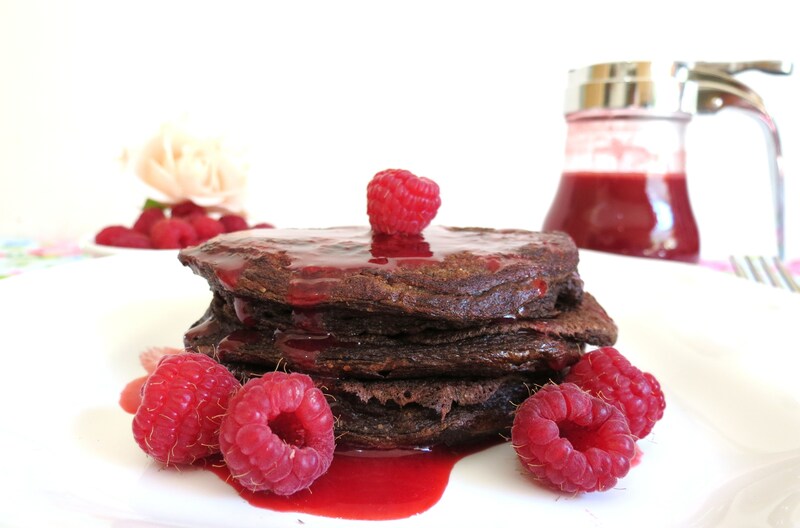 With my pancakes I made a raspberry sauce that is seedless and so easy to make. Even if you’re not in the mood for pancakes, which I think your crazy if your not, you can always just make the sauce. You can put it on oatmeal, yogurt, pancakes, ice cream, french toast or more. The sauce is made with half fresh, half frozen raspberries, though you could use all frozen, a little bit of lemon juice and some stevia. I know I said it before but I like my fruit more on the natural side, but if you like your fruit sweet, add more sugar. That’s whats nice about cooking you can change it up to what you will like. Not everybody has the same taste. I think you know that in my household considering I always have fend for yourself night or I do my Man vs. Woman blogs. My Husband and I have totally different tastes, but I learned to adapt my cooking to meet his personal eating needs. When taking these photos I had to go quick because my battery died on my camera. I charged it for 5 minutes and then took as many pictures as I could, so I am sorry I could not take a picture of the inside of the pancakes. Let me give you a little description. If you’re looking for moist, light, cake like pancakes these are for you! The espresso really added a wonderful rich chocolate taste and the raspberries added a wonderful sweetness, with a hint of tartness. They were sweet enough that I didn’t need to add maple syrup to them, love that. These pancakes exceeded my expectation! Besides the taste, three pancakes not including the low calorie raspberry syrup, was only, ready for this? 127 calories for 3!!! Who loves ya baby? I love this! You could eat all 6 and it still would be guilt-free. You can’t go wrong with a healthy breakfast. It also has 7 grams of fiber and 11 grams of protein! If you really wanted to up the protein in the pancakes, you could always sub chocolate protein powder for unsweetened cocoa powder. I thought of doing that, but didn’t! 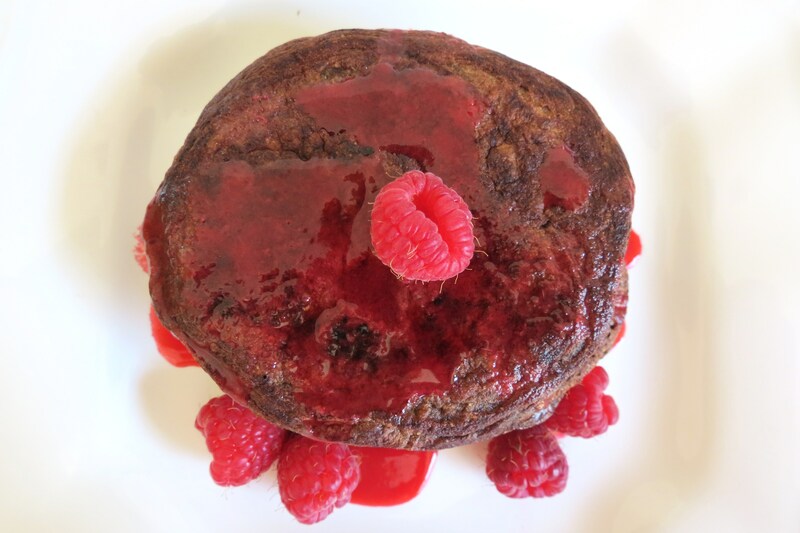 A rich, light chocolaty pancake filled with fresh raspberries with a hint of espresso and drizzled with a sweet raspberry sauce. In a cup, add 1 tsp of instant coffee and ½ cup hot water. Stir till coffee is dissolved and cooled. You will only need 2 tablespoons of this. In a medium bowl, add greek yogurt, egg whites, 2 Tbsp. of instant coffee mixture, vanilla extract and milk. 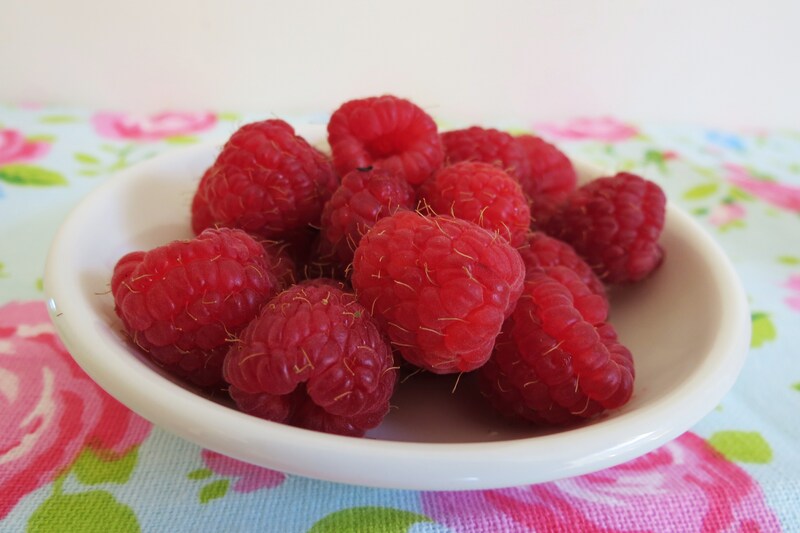 If you don't have time to defrost your raspberries, you can microwave them for 1 minute intervals. I did this for about two minutes. Note: The calories maybe less since we took out the seeds, not sure how that calculates. See I told you no cherries today! 🙂 I was driving to work this morning and I got another one of my brilliant ideas for bread that I want to make. So I am going to make a quickie dinner and hopefully have time to make bread. I’m excited to try this recipe. I get the best ideas for meals when I am commuting to work. I get so excited that I can’t wait to get to work to write it down. Where do you get your best ideas? Well my Friends I hope you like today’s pancakes, it’s been a while since I made traditional shaped pancakes, it was fun! Now tell me what is your favorite kind of pancake? For me, no clue, I love them all!!!!! Enjoy your Wednesday and just think half way through the week!!! Yum – these looks delicious! 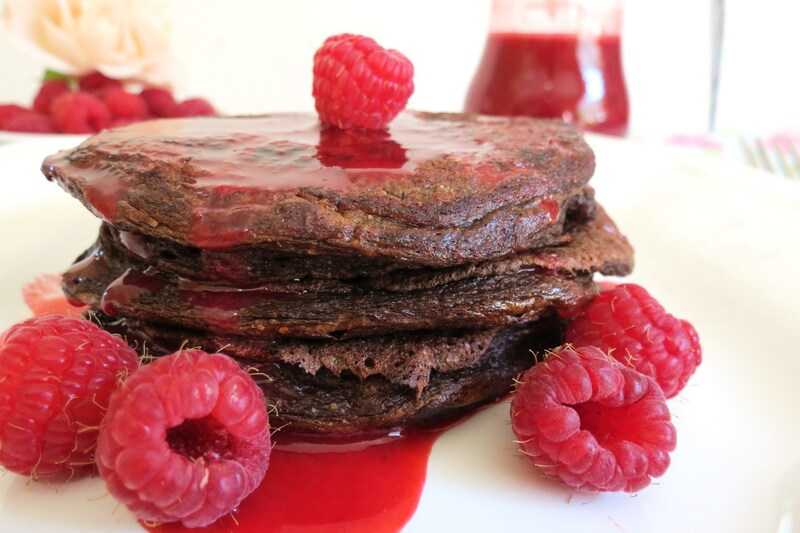 Love the raspberry syrup idea, and those pancakes look absolutely to die for. The syrup is wonderful all by it’s self!! i have been putting it on everything!! I love raspberries too! Think I will make these this weekend, I love pancakes any and all pancakes but 2-3 is all can ever eat but I do like them cold! They fill me up so fast but I wonder if the maple syrup has something to do with that? Never made a raspberry sauce do looking forward to trying that. And…um… chocolate?? Oh yes! Coffee brings out the chocolate taste so these are going to be good! Thanks for posting this, it was a great idea Jennifer! Now I can’t wait to see what kind if bread you make! Have a great day! I’m wondering if it is the maple syrup that fills you? However, these pancakes will fill you up too! It always surprises me how much they do. 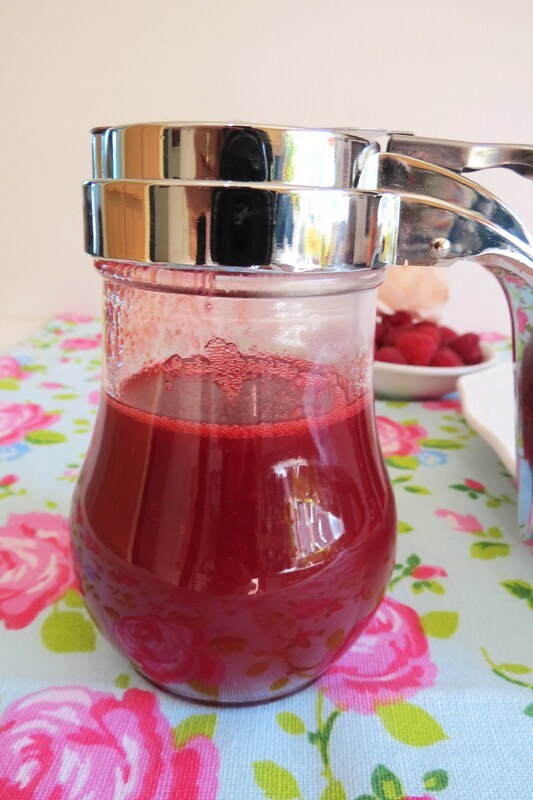 The syrup is so easy to make, and is wonderful added to other goodies. I’m so glad I made it and it is way healthier than maple syrup. The coffee really does bring out the flavor of chocolate! These pancakes you do get a hint of coffee, but not much. With the leftover coffee, I froze it and used it to make a frappe. If you try the pancakes, you must let me know what you think!! I always adore your pancake creations but this one really has ALL of my favorites in it! And an excuse to eat chocolate for breakfast? Love it. Are you sure that you don’t want to re-name your blog “Peanut Butter and Pancakes? You certainly are the pancake queen and these really are amazing! In fact they “take the cake” 🙂 I would have to call this lovely dish dessert for breakfast! YUM! I know I should change my name. I just love pancakes so much. I haven’t had pancakes in years until i started blogging. I look forward to having them almost every weekend!! My Husband thinks I’m crazy! I just think there good!! Have I told you lately how much I love you? Well I do. And this is yet another reason why. 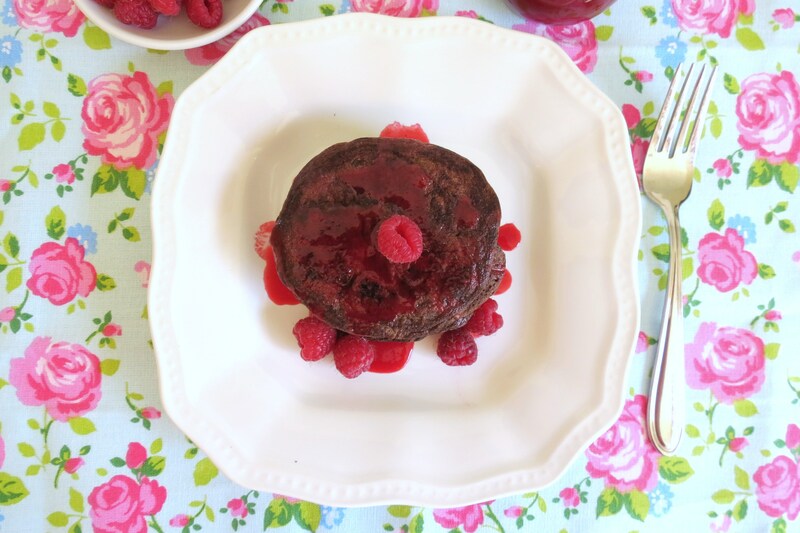 I recently paired raspberry jam with a chocolate mug cake and wow I LOVED the combo. The stats on this recipe are great and I cannot WAIT to try these. I think your funny! I was thinking of you today, I ordered my Liquid Chocolate Stevia so I can make your molten cake. I can not wait!! That is going to be good!! These pancakes sound amazingly flavorful! Great photos. wow wow wow those look beautiful!! i love that combination of flavors!! delicious! what a way to start the morning:) thanks for sharing! so glad i found your blog! These look great! I’ve never had chocolate pancakes, can you believe it!!! Nope I can’t! But I haven’t had it until I started this blog, so I understand. Who thinks of chocolate when you have pancakes? Now I do all of the time. it’s my way of having a healthy dessert for breakfast!! 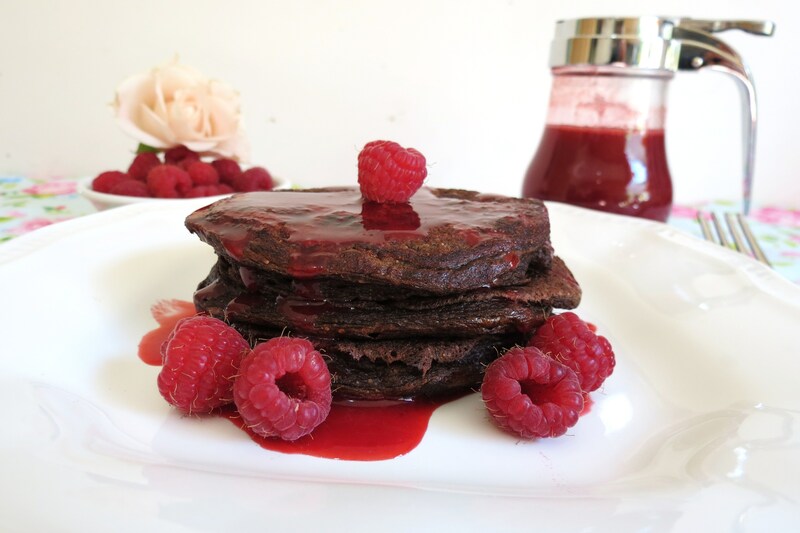 Chocolate + raspberries are the perfect dreamy combo! Jen, these look amazing! I love the chocolate and raspberry combo. Thanks so much for stopping by Creative Thursday last week. I couldn’t do these parties without you. Can’t wait to see what you link up this week. Have a great weekend. I bought loads of raspberries last night (Because who can pass by 5 punnets for £1 at the market?! ), so I thought maybe raspberry pancakes instead of blueberry would be nice, and then I came across this recipe… Very delicious! I took the liberty of substituting the 2 egg whites for 1 whole egg and an extra splash of milk though, purely because I never quite know what to do with the left over yolks. (Unless is Christmas cookie time, which it’s not. ;P) They still worked out lovely. Thank you for letting me know. So glad they turned out for you!